At Essex Taekwondo we teach Practical Self Defence. 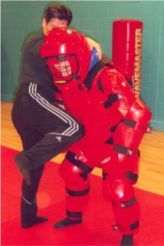 We say practical as the techniques are easy to remember and work against almost all attackers.Our system not only includes the pro-active and pre-emptive physical sides but also the verbal communication side that hopefully means that you will not have to ‘Get Physical’. You will learn the correct verbal and physical posture to hopefully prevent violent confrontation. Master Slater also conducts private corporate ‘Practical Self Defence Courses’.